If you are ready for the eroticism of Desire Resort and Spa, but also demanding of the best of the accomidations, the best meals, the best drinks, the best beachs and 90% of the rooms of a suites, you are ready for Desire Pearl. This is the flagship property of Desire Resorts with all of the best accomidations, the most colorful rooms, the biggest pool, exotic Jacuzzi lounge and spoectacular views, look no further than the all-inclusive, couples-only Desire Pearl Resort & Spa Riviera Maya. This luxury, clothing-optional Mexican Yukatan Resort takes the concept of the original Desire Resort and adds luxury, gourmet dinning, wine paring meals served in the wine cellar, exceptional entertainment, and interesting affluent and delightful guests ready to meet you and share laughs and life experiences with you. You would be amazed who we have met at Desire Pearl! Clothing-Optional with class is the fare at Desire Pearl. This resort is not for everyone, it for the couples that prefer the finer things in life and the audience of other like-kind-quality vacation seekers. The beach at Desire Pearl is amazing and right out of a Mexican vacation brochure. Palm trees, shade, hammocks, beach beds, the clothing-0ptional beach is there for your relaxation. The long, lagoon-style pool hosted by a live bartender is by enough lounge chairs to accommodate all resort guests. The pool is armed with its own poolside wait staff and a premium-liquor-stocked swim-up bar that is strategically situated to serve both pool dwellers. The Jacuzzi Lounge offers a different experience with an amazing new Jacuzzi large enough to hold every guest in the resort! The Jacuzzi has multible levels depending how deep you want to be, and is surrounded by 4-posted beds for your afternoon delight enjoyment. Don't be shy, there are very few rules at Desire Pearl. Desire Pearl is home to three gourmet restaurants, including an avant-garde fusion of Latin and Asian flavors at Jade. European fusion at Pearl mixes the best of Spanish, Italian, French and Lebanese cuisines with a gourmet chef. . This all inclusive resort also offers entertainment programs by day and night in addition to a Lobby Bar and a Jacuzzi Lounge Bar for those wishing to carry on into the wee hours of the morning. One amazing experience is to have dinner served to you out in the middle of the ocean under the Palapa. There is a pier that extends out about 100 years in to the ocean with a deck and Palapa at the end. It is an amazing view of the resort at night! For playtime in the sea, try out complimentary non-motorized sports options like sea kayaks, windsurfers and Hobie Cats. Land-based activities include table tennis and an assortment of fun board games. Indulge in the sauna or steam room or head for the 8,600-sq-ft, on-site spa which offers pampering by appointment. Wait until you see a Penthouse Passion Suite... there are seven of these suite, the top floor of each of the seven villas that make up the resort. The room is amazing and the deck is large enough to play basketball on with endless views of the resort and the ocean. Description: Aphrodite, our international restaurant features a fascinating atmosphere that will delight your senses. Having been designed with the most modern décor and accents in white and blue shades, every corner of the venue harmonizes with the beauty of the setting that faces the turquoise waters of the Caribbean. Dress code: Sensual elegant- Ladies: Revealing outfits and gentlemen: No shorts, sleeveless shirts or men's sandals. Description: Pearl is our avant-garde restaurant serving a Mediterranean fusion cuisine that makes Desire Pearl Resort & Spa unique. Here we have created three perfect menus. The first offers the most delicious specialties in French gastronomy, and two other menus perfectly blend a variety of international delights. Dress code: Elegant- Men wear long pants, sleeved and collared shirts. Men's sandals are not accepted. Women wear sensual night outfits. Description: Our new culinary concept JADE brings the long desired taste for Japanese cuisine to the Caribbean. This unique, romantic hotspot at Desire Pearl Resort & Spa is located just above Aphrodite with an incredible ocean view, providing an intimate yet mystical atmosphere for a night of sensual sushi and martinis with your lover. Reservations required. Description: Romance has never been taken so far. Make your reservations for a superb steak or lobster candlelight dinner served on the beach at our gazebo. Enjoy the sounds of the waves and see the stars during this memorable experience. The Romantic Dinner by the Sea is not part of our All-inclusive packages, it will appear as an extra charge into your account. Located outside the disco, featuring a casual and sensual mix of cocktails and conversation sure to ignite your passion. Open 24 hours. Exciting ocean-view bar offering a full drink menu in a sensual environment. Daily, 10am-6pm. Clothing-optional Jacuzzi featuring a translucent, open-air shower and a full drink menu. Daily, 1pm-3am. Obsession is the resort's disco and features a sensual atmosphere with live DJs who pump out the hottest rhythms of the Mexican Caribbean, sure to fill your night with passion. The resort also features the Sin Room, a private room for couples only. Decorated with dark windows and lounge beds, the Sin Room is the place for wild nights, where almost anything goes. Desire Pearl is located on a gorgeous, clothing-optional beach overlooking the ocean. Beach beds and shaded palapas are available at the beach. The resort features one main, lagoon-style pool and two Jacuzzis. For couples looking for a more sensual adventure, Desire Pearl has games specially designed for you and your partner, including the famous couples-only contest, "Desire Time." Complimentary Internet access is available throughout the resort. Desire Spa features 8,600 sq ft of treatment space, including six treatment rooms offering the ideal refuge for your mind and your body for an additional charge. Complimentary green tea and bottled water are available in a calm waiting room as you relax before your desired treatment. Desire Pearl Resort & Spa Riviera Maya offers a variety of honeymoon packages and services for an additional charge. 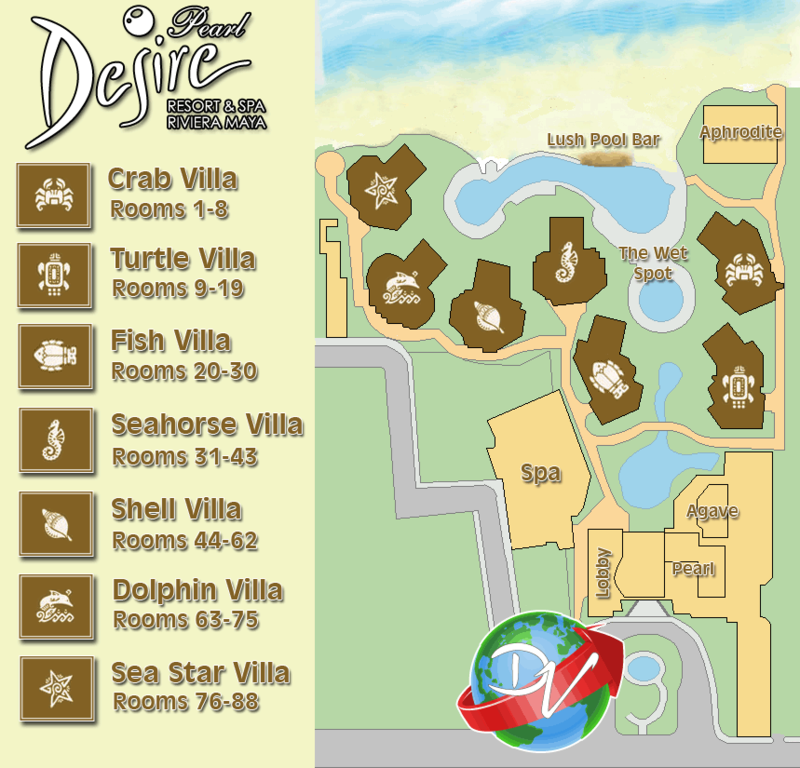 Desire Pearl Resort & Spa Riviera Maya is located 30 minutes from Cancun International Airport (CUN). Airport transfers are available for an additional charge and may be arranged through the resort. Check-in: 3pm. Check-out: 11am. Late check-out: noon (subject to availability). Desire Pearl Resort & Spa Riviera Maya is a couples-only, clothing-optional resort. Guests must be 21 years of age or older. Photos are completely prohibited in public areas. Remember the Golden Rule: "No" means "No!" A 2-night minimum stay is required at this resort with the following exception: A 6-night minimum stay is required for arrivals Dec 27-31, 2015.